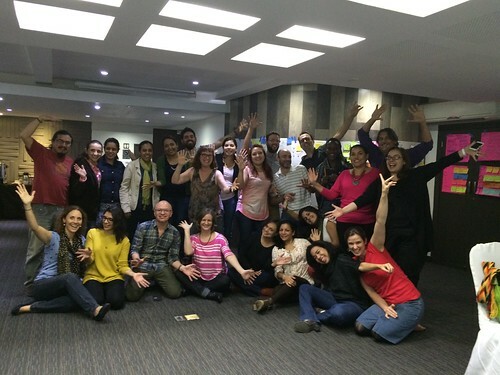 I just returned from doing two days of facilitating a Networked Nonprofit training in Mexico City with Oxfam LAC and participants from offices throughout Latin America, South America, and Caribbean. The first day focused on networks and strategic use of social media along with some practical skills in content creation and measurement. The second day was a networked leadership workshop that focused on how participants could use their personal brands on social in service of the organization’s mission and practical leadership skills training. 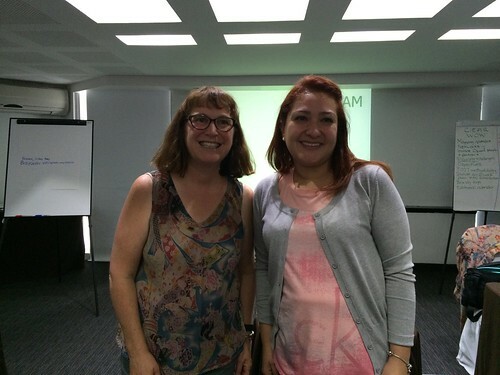 I was lucky enough to be working with the digital strategy coordinator, Maria Rubi, from the Oxfam LAC. She is not only fluent in English (and four other languages in addition to her native Spanish), she is also an excellent trainer and facilitator. It was great to have a co-trainer who knew the subject matter, fluent in English, and who understood group facilitation skills and training approaches. This was very helpful because traditional translation does not help you read the group or adjust on the spot. I do not speak Spanish. In fact, when I tried to order some bottled water in the restaurant, I asked for “Aqua and Bedida,” and the waiter brought me bottled water and a sandwich (“a pepida”). So, I spoke in English, Maria translated for me and she translated for some of the participants who spoke no English. I encouraged them to use gestures to ask me to slow down or rephrase if they didn’t understand. 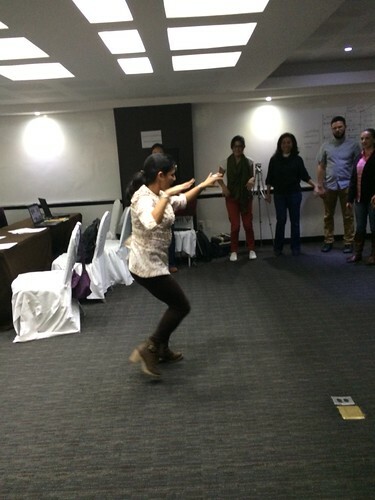 The workshop was a tango dance between English and Spanish — and it worked! 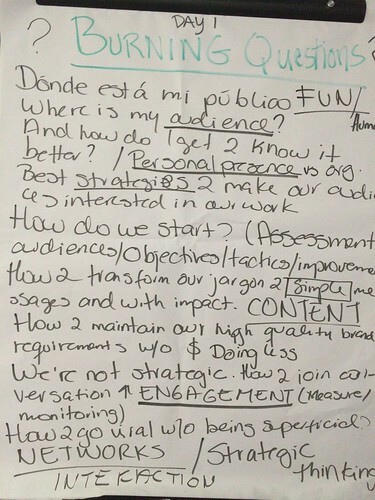 I always like to start with an icebreaker that allows participants to reflect and identify burning questions. Together, we co-facilitated this exercise in two languages and Maria did a great job at bi-lingual capture of the notes. I started with an introduction to the Networked Nonprofit and an assessment that allows them evaluate where their use of networks and social media is along a continuum. Most felt they were at the walking stage and a few crawling, mostly because a few offices were new like the Office in Cuba or that the use of networks and social media wasn’t as intentional as it could be. 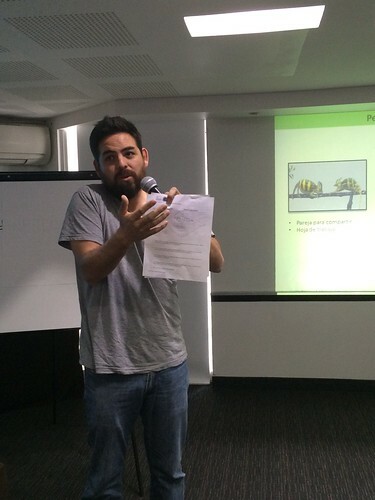 Participants reviewed the social media policy from TNT, which has been translated into Spanish, to see how it could be adapted for their regional network. They also created network maps for each country as well sharing examples using online networks using technology tools. 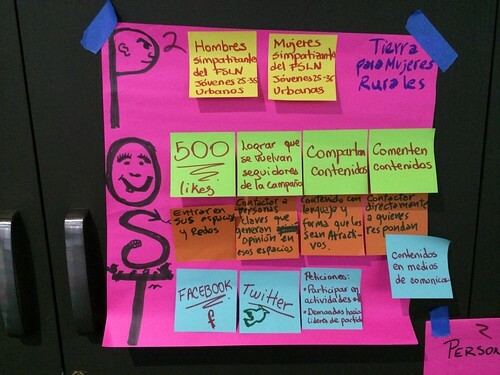 Next, I had them work on a strategic digital strategy that incorporated social media, using the POST Framework. I love how the Office in Nicaraqua created a version with emoji. 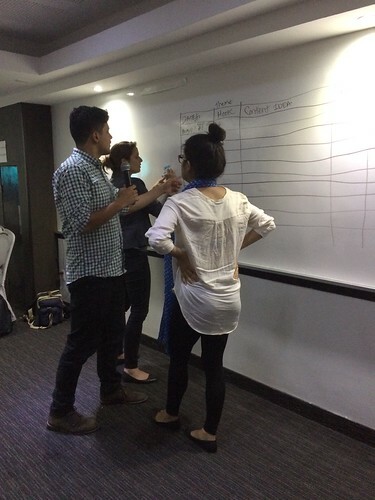 The next exercise introduced participants to the editorial calendar and how to facilitate a brainstorming meeting. Both ideas were new, so it took a little bit of adaption of the templates and techniques, but we managed to come up with something useful for all. We used the resulting brainstorm as the basis for exercises in writing headlines and creating visual content, two of the most important content creation skills for social media staff. This was followed by a session introducing them to basic measurement techniques and tools for measuring social media outcomes. 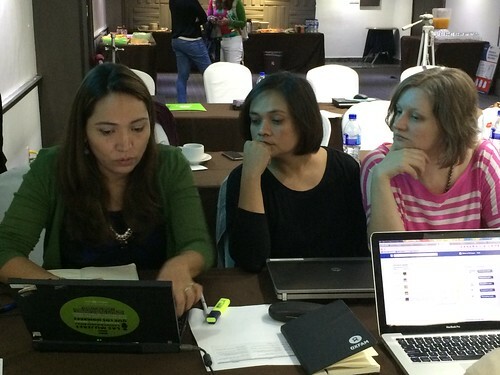 Participants did some hands-on exercises, analyzing their content engagement and consumption on Twitter and Facebook. The next day focused on practical networked leaderships, integrating leadership development and use of social media as your personal brand. I like to teach a combination of online technical skills and leadership professional development which worked really well with this group. 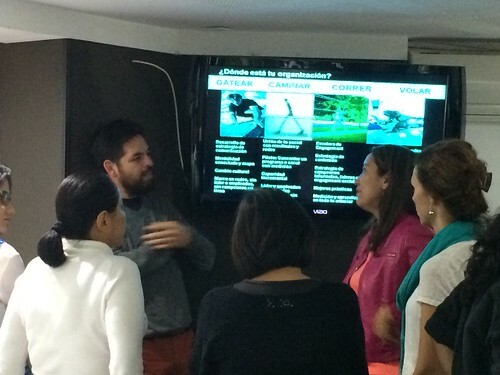 The use of personal brand on social media was a concept that we needed to adapt for Latin America. 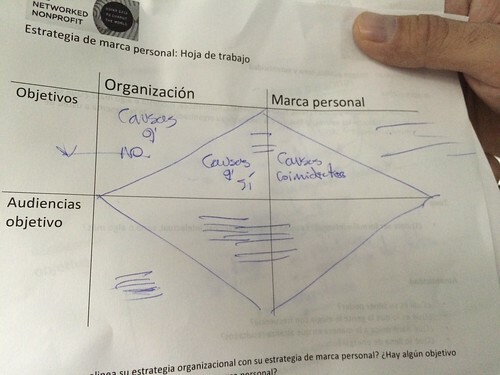 This was part of an exercise to think through how a personal brand can support an organizational brand. We came up with some really practical and useful models. Like I found in London when I taught a similar workshop, the concept of personal brand was not immediately culturally comfortable. We also looked at a campaign strategy called Nofilter built on by the Peru Office and looked at ways to incorporate some of the takeaways from the Networked Nonprofit workshop. 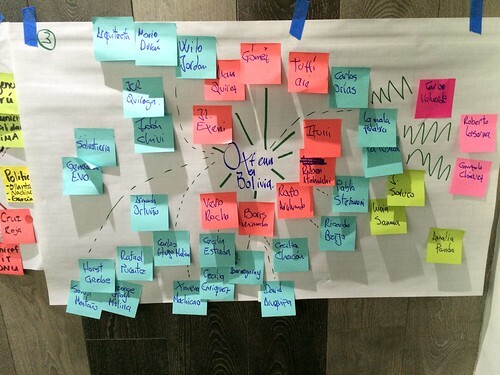 We had a lot of content and process to go through during the two-day training. I introduced them to the idea of walking and movement as work and incorporated some fun energizers that celebrated Latin American culture. We did a poll on the level of energy in the room after about 30 minutes of sitting. Then, I had them demonstrate different dance movements from their country – where one person would demonstrate and every would copy. We did this for 5 minutes. Then afterwards we repeated the poll and they saw how the energy level changed. And because it was National Tequila day, when the workshop was done, we went out dancing and I got an education in Latin American dance movements. All in all, based on the feedback, a successful capacity building experience for all.